The application of very low frequency (VLF) technology in the development of underground safety equipment is an important step towards achieving the mining sector’s objective of zero harm, according to Booyco Electronics engineer and developer, Frank Schommer. 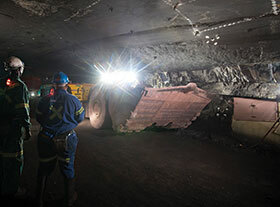 Booyco Electronics began developing ­collision warning systems over 12 years ago, using VLF technology to build a proximity detection system (PDS) for underground mines and becoming a pioneer in this complex field. “VLF,” says Schommer, “is used to generate a magnetic field around a vehicle, essentially a ‘fence’ that is independent of the material present in the immediate vicinity. Due to their frequency, the waves are not reflected by walls or other elements of the environment, rather they penetrate these objects. What is vital is that the corners and crossings in an underground haulage have no effect on the shape and size of the magnetic field around the vehicle, as the waves will penetrate the rock walls and other obstructions that limit what operators and pedestrians can see. However, despite the advantageous characteristics of VLF waves, it is still a challenging process to create a magnetic field to the exacting specifications demanded by safety applications. It requires high levels of power in the transmission antenna to generate the field, for instance, and even in the receiver as well. Schommer emphasises that PDS, when applied in the sphere of worker safety underground, must ensure absolute stability of conditions so that the performance of the technology can always be relied upon to operate optimally. Booyco Electronics’ innovations have leveraged VLF technology to provide valuable functionality for mine safety initiatives. Among the most important of these is the creation of detection zones within the magnetic field around a vehicle, which trigger specific operator warnings and subsequent actions. When a miner – equipped with a VLF receiver and buzzer unit – enters this zone, the system sends a warning through a flashing light and a buzzer, to warn them that they are entering a dangerous area. Importantly, the behaviour of the VLF waves will allow the miner to be alerted even if they are behind a corner or otherwise out of sight of the vehicle operator, when within the detection range. A second zone, closer to the vehicle, is also set up in the PDS to warn the vehicle operator that there is a pedestrian in the proximity. If the pedestrian does not respond to the warnings and gets even closer, they will enter a third zone which could now trigger mechanical intervention, for instance, switching the vehicle automatically to creep mode. Should the pedestrian enter the last zone defined by the PDS – even closer to the vehicle – then a second intervention comes into play, stopping the machine in its tracks to avoid any possible collision or injury. Secure transfer of process data to mobile end devices.